Home > Dog Health > Best CBD Oil For Dogs: An All-Natural Way To Ease Anxiety and Pain? Want to “weed” out man-made pharmaceuticals to help relieve some of your pup’s ongoing health problems? You’re not alone. More and more pet parents are turning to an all-natural alternative, Cannabidiol oil (better known as CBD oil), made from the hemp plant. Studies have shown that CBD oil and other CBD products are beneficial for several human health issues, including anxiety, pain, seizures and neurological disorders. But is CBD effective and safe for dogs? Cannabidiol (CBD) is extracted from the flowers and buds of cannabis (marijuana or hemp plants). CBD, however, doesn’t produce the “high” associated with marijuana because it doesn’t contain the chemical tetrahydrocannabinol (THC). For further clarification, hemp and marijuana both come from the cannabis plant but contain different levels of THC. Marijuana can contain as much as 30% THC while the hemp plant has a max of only 0.3% THC. So, while marijuana-derived CBD oil is still illegal in most states, the hemp-derived oil is legal in all 50 U.S. states. Human use of CBD oil is growing in popularity, especially in states where medicinal and recreational marijuana use is legal. But can you give CBD oil to dogs? 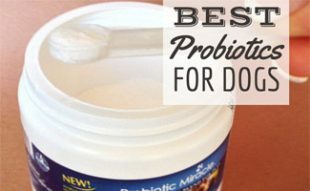 Is it safe for our canine friends and other pets? 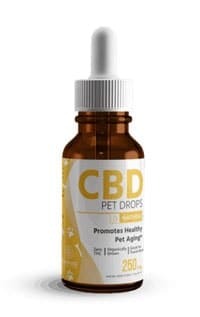 Many vets recommend CBD oil for dogs, even as veterinary scientific research into this new treatment is in its infancy. Studies in humans, however, show that cannabinoids have anti-inflammatory effects and can help with anxiety, aggression, pain, seizures, muscle spasms and neurological disorders. Many people think CBD oil and Hemp oil are essentially the same, but they’re not. CBD is an active cannabinoid compound that comes from the leaves, flowers, and sometimes stems of mature cannabis plants. It’s this compound that provides the medical and therapeutic benefits you get from CBD oil (see below). In contrast, hemp oils are made from cannabis seeds, which contain little to no amounts of CBD (or THC, for that matter). While hemp seeds don’t share the same therapeutic characteristics as CBD, hemp oils have their own unique nutritional benefits. Many pet owners use hemp oil as a nutritional supplement because it’s vitamin and mineral-rich. Like humans, dogs and cats have an endocannabinoid system that allows them to benefit from CBD oil. This system allows the active ingredients in hemp to help relieve many symptoms. Learn more about the benefits of CBD oil for dogs. 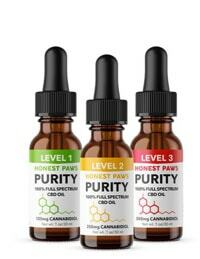 How Do I Find High-Quality CBD Oil? Is it organic? High-quality CBD oils are made from organically-grown hemp that are free of toxins. How is it processed? Safe methods include carbon dioxide and cold press extraction. Some companies, however, use cheap methods and potentially toxic solvents, like propane, hexane and butane, to extract THC from the plant. Is it independently tested? Look for companies that independently test their products and provide a certificate of analysis (COA). 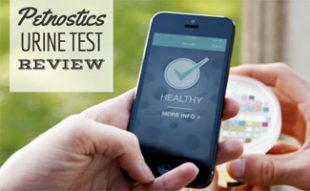 Testing can include Microbiology, Pesticide, Mycotoxin, Residual Solvent, Heavy Metals and more. What’s the THC level? Check every product for its THC potency. Some products contain higher levels of THC, which could be harmful to your pet. Look for products with less than 0.3% THC. All of the products we recommend are derived from hemp and, thus, should always fall below this level. Vets and experts urge using caution when giving CBD for dogs, mainly because there haven’t been enough scientific studies to prove its efficacy or safe dosage level. Still, many vets already recommend CBD oil for dogs. Unfortunately, there aren’t regulated dosage levels yet. Consult your veterinarian before you give your pet any treatments. Start with a very low dosage (0.25 mg once a day) and slowly increase if needed. Monitoring your dog’s response to CBD (or any medication) is crucial. Take into account your dog’s weight, size and activity level — these factors can help you determine how your dog will metabolize CBD (and other medications). Find a high-quality CBD oil that’s free of any kinds of toxins. Since the industry isn’t yet regulated, there are some potentially sketchy products out there. Buy the correct potency for your dog’s size. Most oils come in different CBD potencies, e.g., 75mg for small dogs; 300+mg for large dogs. Each company differs in the potency levels offered. Note: this is not the THC potency. 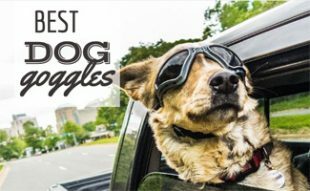 Here are our top picks for companies that sell high-quality CBD oils, CBD dog treats and other related products. King Kanine is a top manufacturer of CBD products exclusively made for pets. Their King Kalm line includes oils, treats, balms and soothing sprays. They make their CBD oil from naturally occurring Phytocannabinoid-rich (PCR) broad spectrum oil. They then suspend the CBD in omega-3 rich krill oil, which includes essential fatty acids known to be an efficient catalyst for delivering CBD to the body. Many holistic vets recommend King Kanine products. Learn more in our interview with King Kanine’s founder Jeff Riman. Our readers have access to an exclusive 10% off at King Kanine offer just by using this link. 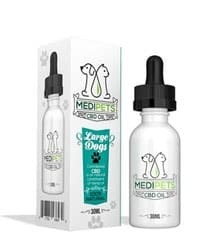 MediPets is a top U.S. manufacturer of pure CBD oils, treats and sprays for both dogs and cats. If you prefer treats to oils, MediPets sells more than a dozen types of dog treats and a couple of different cat treats. Your purchase from MediPets also contributes to their non-profit partner, Saving Sage Animal Rescue Foundation, a non-profit and volunteer-run animal rescue organization in South Florida. Saving Sage dedicates time to the most urgent, abused and neglected animals to keep them out of shelters. Get 30% off your MediPetsCBD order with the coupon code CBDEALS30 via this link. HempMy Pet makes all of its products from their own organically-grown Colorado hemp and certified organic carrier oils and ingredients sourced from sustainable growers. They use hemp seed oil and coconut oil as their carriers, both of which are beneficial dietary supplements. 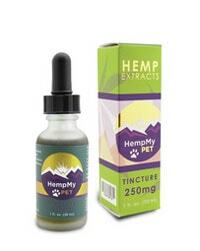 HempMy Pet’s tinctures and oils are made to human-grade quality and contain less than 0.3% THC. The company also contributes to animal rescues and sanctuaries. You can save 10% if you sign up for auto shipping with HempMy Pet. We are not aware of any active HempMyPet coupons at this time. 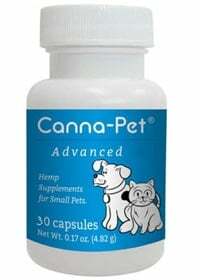 Canna-Pet manufactures CBD oils and capsules for dogs, cats and horses and a variety of CBD dog biscuits. They claim that their products deliver 10-15X the bioavailability of other hemp products. Canna-Pet’s website, however, doesn’t provide any proof to back up that claim, nor do they make public a COA that their products are independently tested for potency or toxins. For this reason, we recommend going with another company for now. Save 25% off of Canna-Pet and have an additional 25% donated to WildLife SOS with code WILDLIFESOS via this link. Hempure manufactures and sells a wide variety of CBD products for humans, but they do offer CBD oil and chews for pets. They only carry one size of oil and one type of pet chews, and their formulas don’t specify whether they’re for dogs or cats. However, they guarantee that their formulas contain 0% THC. Save 20% off of Hempure CBD with code SAVE20 via this link. Honest Paws offers CBD-infused dog oils, treats, soft chews and even a creamy peanut butter. They say their CBD oil is also safe for cats, but they don’t offer cat-specific products. This company uses its proprietary supercritical CO2 process to extract the CBD from “premium-grade” hemp plants and then emulsifies it in all-natural MCT Oil that’s extracted and refined from renewable coconut farms. Get Free Shipping on orders more than $40 at Honest Paws with code SAVE20 via this link. Want to learn more about CBD and the benefits for your dog? Check out this brief video for more info. What Meds Are Safe For My Dog? If you’re still wondering about the safety of cannabis for dogs, be sure to read our in-depth article that discusses 7 things you need to know about marijuana and dogs. Not sold on hemp products to relieve your dog’s pain or other health concerns? Some other natural options include essential oil therapy, acupuncture and massage. If you are seeking a more pharmaceutical route, read our companion articles to learn which pain meds are best for dogs and which OTC medications are safe for dogs. Have you ever given your dog CBD oil? What happened? King Kanine seems to be doing it’s job (I’m not sure because so many things are changing at the same time for our old pup, including warmer weather which is easier on joints). However, I’m no longer able to read the quantity markings on the dropper! They completely came off after just a few days. Just some improvement feedback for the company in case you’d like to pass that along. We contacted King Kanine on your behalf and they replied that they are aware of the syringe issue and have fixed it. The new syringes will be in the next wave of bottles, probably shipping out to customers by the end of the month. Great review! Okay, so I’ve tried both your #1 and #2 (King Canine and Medipets). I have to admit I still don’t understand the dosing. So for our 55lb lab mix, first we used Medipets 100mg which said to put 2-4 drops in her food up to 4x/day. She seemed to improve slightly on this regimen but that could just be my imagination. When we ran out, we thought we’d give King Canine a try. We ordered the 150mb bottle, and dosing here is by syringe, they advise directly into our dog’s mouth. The amount is waaaaay more, in fact they advised us to start with 2mg, once in the morning. That’s a like half a teaspoon full of oil. So far we don’t see any noticeable difference and the bottle will empty itself at no time at this rate. Sally I saw your chart below, may I ask where this is from? To me the provider pages don’t make this clear at all. My last question is – how effective is it to put the oil directly on their tongue vs in their food? Thanks for taking the time to answer my questions on this confusing topic!! Dosing differs widely by each product (and each product has different strengths and recommendations). Unfortunately, there aren’t really any general overall guidelines available for dosing (just as there aren’t for human CBD oil). For that reason, I’d advise you to talk to your veterinarian about the specific CBD oil concentration you should give your dog. To answer your last question, studies are still ongoing about CBD oil and pets, so there’s no definitive evidence that putting the oil on their tongue vs. in their food is more effective. And we can’t find information if one is more effective than the other. (Although it appears to be more effective with humans to apply the oil directly to the tongue). 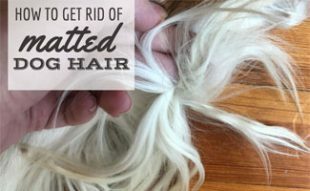 Again, I’d advise you to follow the instructions on your product — AND always consult your vet when you’re giving your dog any kind of supplement. Thanks for your questions! Hi I would like to know before I go a head and buy any of your CBD oils for my dog can you tell me how the oil is it processed? Currently, there are no regulations on the manufacturing of CBD oil which means that some companies selling it cheaply may use cheap methods when extracting it from the plant I hope thats not you. Hexane and butane are two solvents that are petroleum based products and I no are not fit for consumption and can be toxic. Can you tell me what’s the THC count? as some companies make CBD oils from a high THC plant which can also be toxic to animals. Is less than .03% THC? We don’t actually make the CBD oil, we review the best CBD oils to help you make an informed decision. If you have specific questions about one of the oils we can try our best to answer them for you. You can also reach out to the company itself. Let us know if we can help further! I was a little concerned about them not being “non-GMO” verified, but when one of your “pros” for them says they don’t use pesticides, isn’t that essentially non-GMO? We’re sorry the page is loading so slowly for you. We tested this out but didn’t have any problems with page loading speed. Please let us know if you have any other questions or concerns. We highly recommend King Kanine products. My dog has seizures. She usually has 1 every month. Now she is getting them like every 7-15 days.. I want to try cbd oil… Where to buy best quality cbd for her? Did you read the article, Jennie? It has links to our top picks. 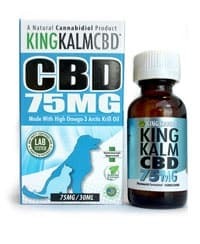 I’m thinking about getting some CBD for my dog. I’ve heard it can help a lot with anxiety. It’s good to know that I should make sure I find CBD that is high quality and organic for the best results, like you said. My dog has been having problems with joint pains. It makes sense that getting CBD oil would be a good idea! It’s good to know that you can get it in a form that works well for dogs.